August 22, 2017 is National Take Your Cat to the Vet Day. While many of our wonderful clients know this already, not everyone knows the importance of scheduling regular wellness check-ups for cats. Here are some good reasons why you should make sure to schedule your cat’s wellness visit today. Did you know that although 83% of cats visit the veterinarian during their first year, many never go back until they are sick or in pain? Many people think they would know if their cat had a problem, but the reality is it can be hard to recognize signs of illness in a cat until they’re really in trouble. Cats age faster than people. We all have heard that one year in our lives is like 7 years to a cat. This is not quite true, as cats age faster during their first 2 years, and then it slows down to about 4-5 “cat years” for every “human year”. But have you ever stopped to think what their aging faster really means? 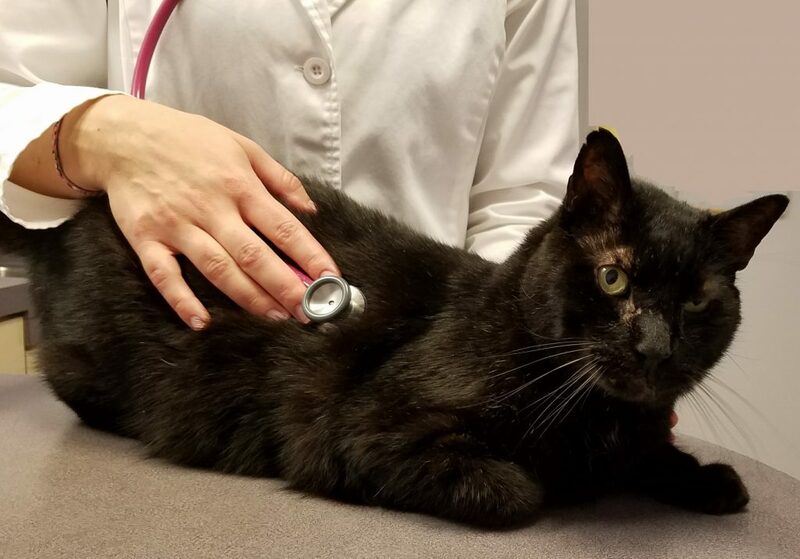 If your 8 year old cat only goes to the vet every 2 or 3 years, that would be like a person not going to the doctor for 10 years! That’s a long time to not get a check-up. A lot can happen in four “cat years”, which is why regular check-ups for cats are important. Cats are masters at hiding illness. Many people think “slowing down” is normal as cats age. But your cat may be exhibiting arthritis/joint pain or may have early kidney or liver disease. During the comprehensive physical exam, our doctors may be able to detect problems before they advance or become more difficult to treat. Over 50% of cats are overweight or obese. We will check your cat’s weight at every visit and provide recommendations to help keep your cat at an ideal weight. Just a few extra pounds can put cats at risk for diabetes; heart, respiratory, and kidney disease; worsening arthritis; and more. One excess pound in a cat is like being 10 pounds overweight! Preventive care is better than reactive care. When you bring your cat in for a visit, we can discuss any behavior changes you’ve noticed. Has anything changed with your cat’s eating patterns? Amount of water your cat drinks (ie are you filling the bowl more often) ? Any change in activity level or litter box habits? The information you provide us, along with a thorough physical examination, allows us put together a plan to keep your cat healthy. And regular exams can save you money by helping to avoid costly medical emergencies. Cats have a lot of teeth! Despite their mouths being a lot smaller than ours, adult cats have 30 teeth—only two fewer than people. Periodontal (gum) disease is considered the most prevalent disease in cats three years of age and older. Often there are no obvious signs of dental disease. Most cats with dental disease still eat without a noticeable change in appetite! Regular check-ups and dental cleanings can help prevent tooth loss, painful gums, and other seemingly unrelated problems that may arise due to the bacteria involved with plaque and tartar on your cat’s teeth. Ok, we’ve given you five pretty important reasons to schedule regular wellness check-ups for cats. At A Cat Clinic, we are offering a free nail trim if you schedule a wellness exam before the end of August, 2017 and mention you saw this post. So don’t wait, schedule your cat’s check-up today! For more information about what goes on during a wellness check-up for cats, watch our video, visit our Wellness Care page, or check out the Royal Canin website page Veterinary Checks and the Adult Cat. To learn more about Take Your Cat to the Vet Day, visit the AAFP website.